I officially jumped on the hype bandwagon with this one. The bottle looks like the Laura Mercier Silk Creme and a range of bloggers seemed to be loving this over and above their Silk Creme, therefore I had to find out what all the fuss was about. I went for Pearl in the Luminizing Moisture Tint as it seemed that it would suit my skin quite nicely, on the online photos. However, when it got to me, it would seem I have gone for a shade too dark for me and Opal would have been a better match. The Moisture Tint definitely is a tinted moisturiser product. It is quite sheer and sinks into the skin really well. The Luminizing aspect is not overly luminizing as I was worried about and in fact only gives a subtle dewy glow. As the Jouer Matte Moisture Tint is obviously the matte version of this product, I opted for the luminizing as I prefer a dewy complexion and really hate having my skin looking matte. Yet, if you love matte foundations, perhaps the matte tint would be great to try. I was scared that the luminizing product would be at the opposite end of the scale to matte and would leave my face shining like a disco ball, but luckily that is not at all the case. It just gives a lovely glow to the skin. For me, the coverage is sheer and quite minimal. If you were to build this up, it does build somewhat to allow for a slightly higher coverage yet it is definitely not as covering as the Nars Tinted Moisturiser for instance. However, it will be lovely for summer when I have a touch of sun on my face and I only want a light coverage. The SPF20 will also be a huge bonus. I have been adding this to my Laura Mercier silk creme to give a slightly lighter coverage and even more luminosity which I’ve been really liking also. I have provided you with so many foundation swatches above as I wished there had been something like this around before I bought this product in a shade too dark. 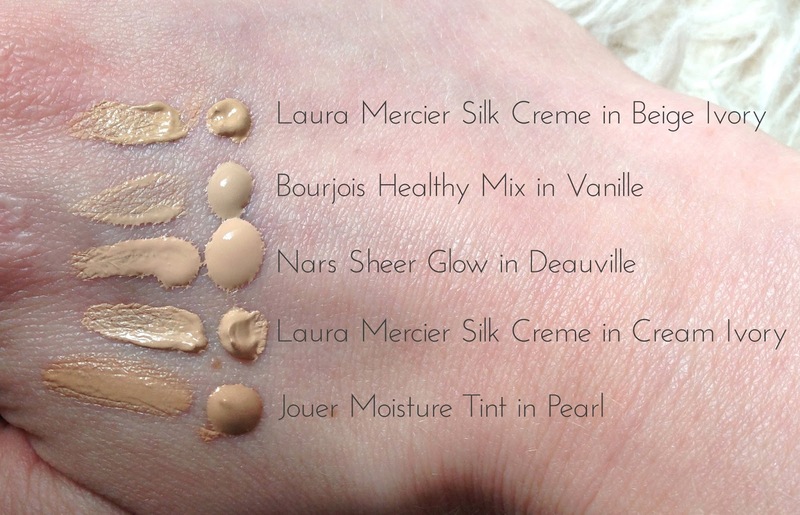 I’ve included a range of foundations so that hopefully you can compare the colours of the Jouer against a colour you may already own, so you can get a true comparison. I was also sent a small sachet of Jouer in Opal with my purchase, so I know Opal is the shade for me. 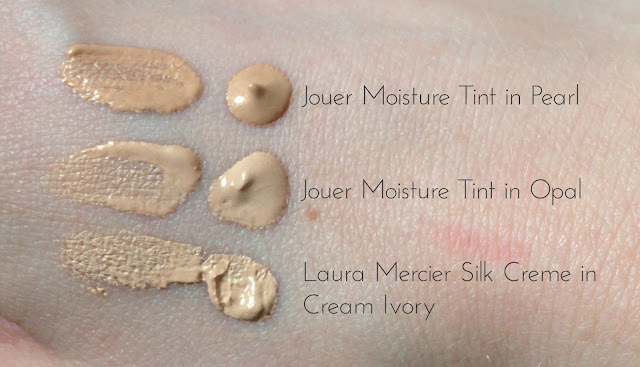 I’ve placed the two shades side by side above and have also included Silk Creme in Cream Ivory to show you how similar it is to Jouer’s Opal. If you’re a cream ivory kind of girl, then Opal is the shade for you. Would I buy this again? At this point in time I would say no, yet I am going to take this away with me on my road trip and report back after I have used it thoroughly. It isn’t quite as covering as the Nars Tinted Moisturiser and I prefer to feel slightly more covered by a moisturising tint, especially for this price. Yet, if you love sheer foundations due to having a great complexion and skin tone, then this could be for you. In terms of a sheer, light moisture tint, this is definitely an excellent product.